If you have been reading my posts for a while now, this will come as no surprise: I like order. I am the girl who puts away markers and crayons in rainbow order, who always keeps her money in descending order by denomination, who organizes books on the bookshelf in order of decreasing size…well, you get the idea. So you’d think that I’d love Linnaeus, right? He was all about order…and class, phylum, kingdom, species, genus, and family! It’s all so neat and tidy. Or it would be if it worked—but it doesn’t really. Misconception: A species is a clearly defined natural unit. Correction: Eh. We don’t really even know what a species is. If I asked you to define species, you’d probably come back with something like “A group of organisms that can successfully produce offspring.” This is known as the biological species concept, and its primary advantage is that it’s super easy to Goldfish—not a panda. (Lmbuga via Wikimedia Commons) understand. Female panda bears mate with male panda bears and produce baby panda bears. Put two goldfish in a bowl and you may soon have a bowl full of baby goldfish. Mix a panda bear and a goldfish and you get…a panda and a goldfish. 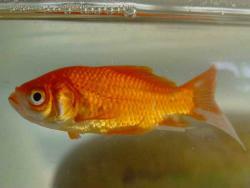 Ergo: panda bears and goldfish are two separate species. Easy! But things get not-so-easy really quickly. A case in point: lions and tigers. Different species, right? But what about ligers and tigons? Cross a male lion with a female tiger and you get a liger. Male tiger crossed with female lion gets you a tigon. Wait! You say, but aren’t ligers and tigons sterile? Everyone knows that members of the same species produce fertile offspring. Were it not for the “fertile clause,” horses and donkeys would be considered the same species! 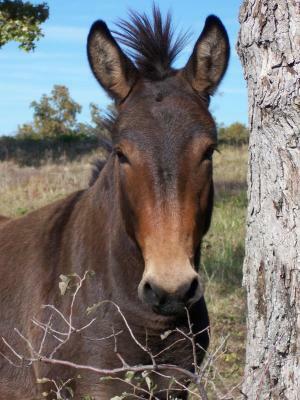 A mule—tried to find a royalty free photo of a hinny, but had no luck. (Off2riorob via Wikimedia Commons) (Fun fact: everyone knows about mules, which result from a cross between a male donkey and female horse. But do you know what a male horse and a female donkey get you? A hinny! You can use that at your next cocktail party—no need to thank me.) But here’s the thing: some ligers and tigons are fertile. 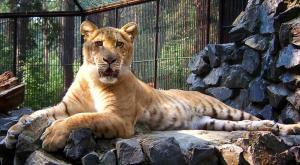 A zoo in India once had a litter of litigons (male lion cross female tigon) and a Russian zoo boasts four liligers—cubs that resulted from a cross between a female liger and a male lion. A zoo in Oklahoma has them, too. Darn. Now what? What if we add a “in nature” clause? I mean, lions and tigers don’t live in the same environments, so they wouldn’t come together to mate in nature, right? Well, while this works pretty well for lions and tigers, “in nature” totally fails when it comes to plants. Plant species can be downright promiscuous, just hybridizing all over the place. And then there is the issue of polyploidy. To explain, we have to dip our toes into some super basic genetics. Almost all the cells in your body have two sets of chromosomes. These cells are called diploid, or 2n. Where did each set of chromosomes in your 2n cells come from? One came from your mom and one came from your dad. So it stands to reason that egg and sperm cells need to have one set of chromosomes each, not two. Such cells are called haploid or 1n. (1n + 1n = 2n, see?) Well, pretty darn often, plants produce eggs and sperm that are 2n. Mix a 2n egg with a 2n sperm and you get an offspring that is 4n. Weird, right? Well, here’s the kicker: that 4n plant can no longer reproduce with 2n plants. So, if we are going with the biological species concept, two parent plants just had an offspring of a different species. So what’s an educator to do? I’d advocate for honesty. Tell your students that the Liger at Novosibirsk Zoo, Russia. (Алексей via Wikimedia Commons) biological species concept is a helpful tool, but it’s really just an approximation. There is another learning opportunity here, too. Lions and tigers, horses and donkeys can form hybrids—why? Well, they are very closely related organisms! They’re neighbors on the continuum-tree-of-life. So it kind of makes sense, doesn’t it? As for plants, well plants reproduce asexually and sexually and single-celled organisms reproduce asexually, so it sort of makes sense, again, that a concept that relies on a mom+dad=offspring framework breaks down. I’d tell students that just because it isn’t neat and tidy, it doesn’t detract from the diversity of life—on the contrary, I think it makes it a bit more awesome. Plants double their genomes? Bacteria swap DNA? That’s cool! In other words, embrace the blurred lines; let a thousand flowers bloom; there is grandeur in this messy view of life. Have an idea for a future Misconception Monday or other post? See some good or bad examples of science communication lately? Drop me an email or shoot me a tweet <at>keeps3.